Provenance: unknown: Cecil French by 1947. Exhibited: Harris Art Gallery, Preston, "50 Years Ago", 1947, (64); Sheffield and Wolverhampton Art Galleries, John William Waterhouse R.A., 1978 (13); Barbican Art Gallery, London, The Last Romantics, 1989 (109). Literature: A.Hobson, The Art and Life of John William Waterhouse R.A., 1980, p.104, pl.88, cat. 118; A.Hobson, J.W.Waterhouse, 1989, pp.57, 64, pl.48; N.Minato, J.W.Waterhouse, 1994, illus. on title page. A young woman with long dark hair, wearing a red long-sleeved dress and white surcoat, kneels, looking at her reflection in a large cheval glass which stands on the floor. She is facing to the left, looking upwards with her hands behind her head, entwined in her hair. Behind her, to the right is an open jewel casket with jewellery and love letters spread around it. Mariana is praying for the return of her lost love, the tyrant Angelo, who cruelly spurned her on the loss of her dowry. The picture illustrates the line "And in the liquid mirror glowed the clear perfection of her face." from Tennyson's poem of the same title which was, in turn, inspired by Shakespeare's Measure for Measure. Tennyson wrote two poems based on the same episode in Shakespeare's play;Mariana, published in Poems Chiefly Lyrical, 1830, and Mariana in the South, published in Poems, 1832. The painting is a study for a smaller painting of the same name, 114.3 x 81.3 (45 x 29) which was exhibited in Liverpool in 1897 and was on the Art Market in 1980. The composition is virtually identical but the finished work lacks the casket at the right, it is reproduced in Hobson, 1989, pl.47. 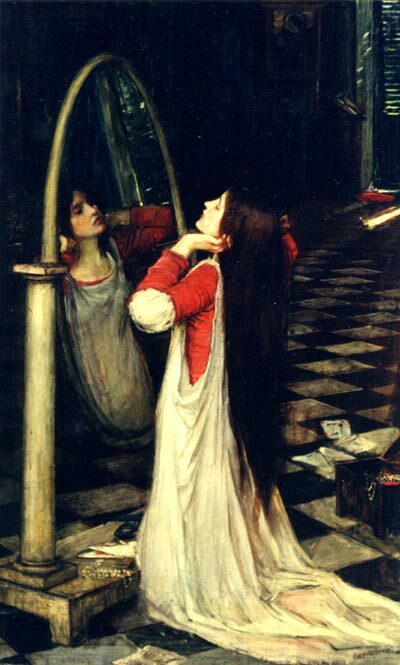 Waterhouse almost certainly knew Rossetti's treatment of the subject, drawn for Moxon's Tennyson of 1857, which also contains a bizarre "mediaeval" mirror and scattered love letters. Uncharacteristically for Rossetti, his treatment is truer to the poem than Waterhouse's for the latter has elided earlier and later incidents in the verse. Rossetti's later oil painting of Mariana, 1868-70, in Aberdeen Art Gallery, was taken directly from Shakespeare's play. Waterhouse took several subjects from Tennyson including two others from the Poems of 1832, St. Cecilia (1895, private collection) and his most famous painting The Lady of Shalott (1888), in the Tate Gallery, a subject he returned to in 1894 (Leeds City Art Gallery) and 1915 (Art Gallery of Ontario, Toronto).